Having so much life on my plate right now I didn’t even let myself fantasize about joining the Knitting Olympics, either on Ravelry or with the Yarn Harlot and her blog. (Well, honestly I did fantasize about it, from behind firmly closed eyelids during sleepless snatches circa 3 a.m.). I don’t *really* have anything on my needles right now, a few swatchy things that aren’t pleasing me, so I was in a position to take a stab at a challenge. Hecky darn, even a baby hat for my beloved grandboy would have been a challenge for me these days! Probably a good idea that I didn’t succumb this time, even though I was ever so tempted. One of my long range knitting goals is to make myself a sweater with our own lovely Coopworth yarn, and I had the momentary thought to try that. Momentary is the keyword here! triangular scarf of dk weight Coopworth, a silver grey that I space-dyed sometime last summer. 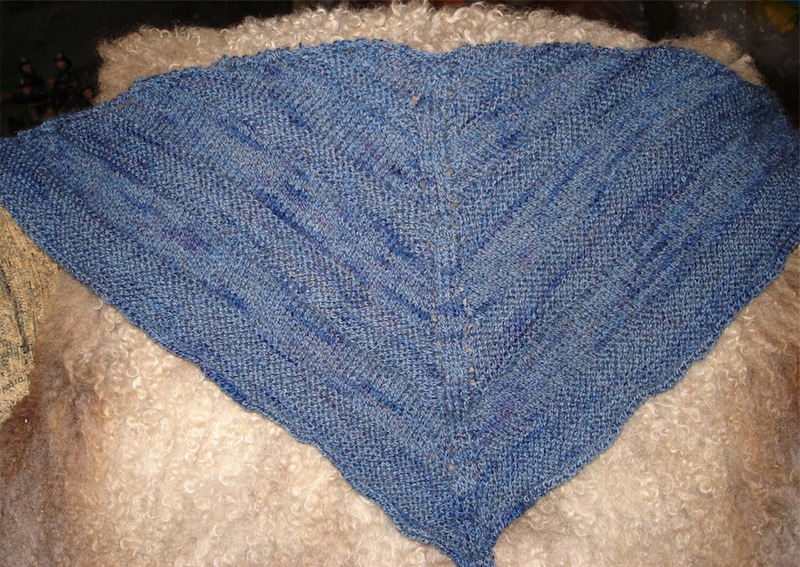 I love it, although if I had had another skein, I definitely would have made it longer. I love the pattern that Pam of Hatchtown Farm helped me get going (I have long admired a scarf of hers that she knit in a similar way). It’s random knit and stockinette bands with a center line of 3 stitches down the middle. Increasing on either side of this center band makes the scarf an almost autopilot project (started at the neck). This seems to be my speed these days as my brain is frazzled and pulled in too many directions to do much more than that!